The View - Panes - Contents pane displays controls and information for whatever is the active window, automatically adjusting to whatever is the current tab within the current window. Like all Manifold panes the Contents pane can be docked or undocked by Alt-clicking the title bar. An undocked Contents pane can be resized and moved anywhere on our Windows desktop. See the User Interface Basics topic. We can switch between the Project pane and the Contents pane by clicking the tab of the pane desired. Component - Coordinate system and other basic information for the component, including the current layer in a map or other window, that is open in the active window. Layers - A list of layers in the active window, controlling layer opacity, order and visibility. Record - View and edit attributes and geometry. Select - Make selections using templates or free-form expressions, and save and combine selections. Style - Control formatting and style in drawings and channels and display characteristics in images. Transform - Manipulate data using a vast range of templates or free-form expressions. Click on the caption of a panel for a pull-down menu of the other panels. Keyboard shortcuts using Ctrl-1, Ctrl-2 and so on switch direclty to desired panels as well. The Component panel displays information for the active layer or window. When a table has the focus the Component panel will report the number of records in the table. Clicking on a component shown in the Component panel will switch to that component in the Project pane. Projections: The Component panel in the Contents pane is our primary interface for seeing and changing projections. the coordinate systems assigned to components and to edit those coordinate systems. In Manifold, the terms "projection" and "coordinate system" are synonyms and are used interchangeably. Black projection name - Indicates the coordinate system has been assigned. Modern GIS formats will automatically specify the coordinate system to be used when we import a drawing or image from such a format. They will appear in the right places in maps with other layers, we can re-project them if we like and so on. Red projection name - Indicates the coordinate system must be manually assigned before that data can be used. Older GIS formats or non-spatial formats, such as CAD formats, often will not correctly specify the coordinate system use by their data. In such cases, the default coordinate system, WGS 84 / Pseudo-Mercator (EPSG:3857) will be assigned as a placeholder, and red text is a warning that the correct coordinate system must be assigned before any further use of the data. Assign Initial Coordinate System - If a component is imported from a format that fails to specify the coordinate system it should use, we must do so manually. Until we assign the initial coordinate system to use the coordinate system read-out for that component will use red text. Once we assign the initial coordinate system the read-out will switch to black text. This command should only be used once, immediately after initial import or linking of a component. Repair Initial Coordinate System - If people never made mistakes we would not need this option. Sometimes a component is imported from a format that incorrectly specifies the coordinate system it should use, and we must manually change that initial setting to the correct coordinate system. At other times, we might have used Assign Initial Coordinate System to specify the initial setting but we made a mistake and specified the wrong projection. This option allows us to repair such errors by specifying the correct initial coordinate system. Change Coordinate System - This is the routine command we use to re-project data into whatever projection we want. Suppose, for example, we import data that is in Latitude / Longitude format but we want it to be in pseudo-Mercator so it is a better match to web servers and so we can better measure distances. This option allows us to re-project the data as we like. To change a projection, click on the coordinate picker button. Number of records: When a table has the focus the Component panel will report the number of records in the table. To switch to a Contents pane panel, click on the current panel's caption and choose the desired panel from the drop down list. We can also use the keyboard shortcuts Ctrl+1, Ctrl+2, ..., Ctrl+6. 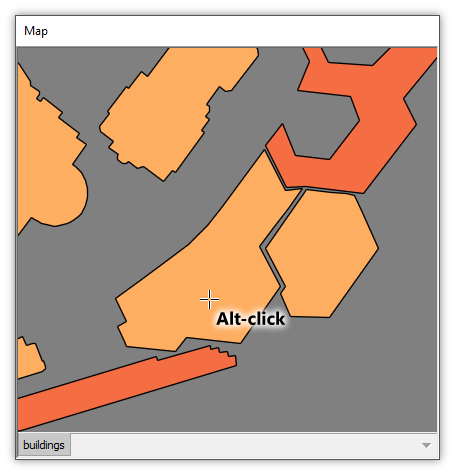 The Layers panel shows the layers in a map, drawing or image along with % opacity settings for each layer and an on/off toggle box. Double-click an opacity setting or toggle box to change it. In the illustration above all of the layers are on except the Bing street map layer, which is off. The Background layer is a virtual "layer" present in all visual display windows. It provides a layer of background color, default white, as seen in the sample color box. Double-click into the color box to change the color. When using imageserver layers like Bing, which completely fill their layers with pixels, the background color, of course, will not be visible if the imageserver layers are at 100% opacity. The Record panel displays field values (attributes) and coordinates for objects that are Alt-clicked in drawing layers. 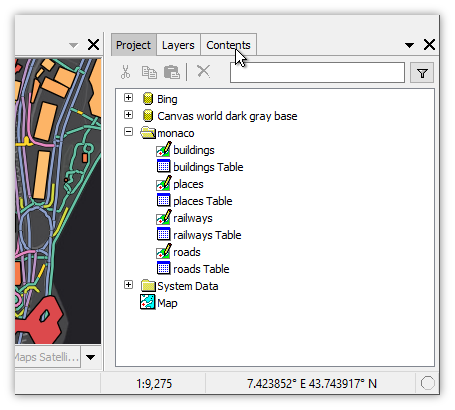 The Record panel is our primary interface for editing either field values or geometry for objects in the map window. Alt-clicking onto an object in a drawing automatically pops open the Record panel to the Values tab and displays field values for that object's record. The designated object is marked in the map window with small blue boxes at the location of coordinates that define it. In addition to displaying field values for the object's record, the Values tab also allows us to edit field values for that object. Clicking the Previous and Next triangle buttons at the top of the list will step through the previous and next records in the drawing's table. Clicking the Coordinates tab enables the object geometry for editing in the map window, switching vertex boxes to slightly larger handles. 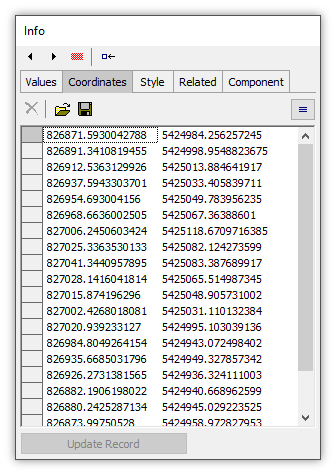 We can edit the coordinates either in the map window or in the Coordinates list. The Select panel implements selection for tables, drawings and image layers. The panel automatically applies to whatever open component window has the focus. Select templates operate upon fields for the component's table. In the illustration above we have entered text into the Filter box to reduce the long list of available templates to only those which contain 'text' in their names (case is not significant). That makes it easier to find the template we want. For example, with the focus on the sample drawing layer, we can click on the Text Contains selection template, click into the Value box to choose the name field and enter Star as the Search for text. From the example for the Record panel above we know that will select at least the Monte Carlo Star building in that layer. The moment we finish keyboarding Star the system will preview what objects will be selected, using blue preview color in the active window. To select those previewed objects we click on Replace Selection. Selected objects will appear in the active window in red selection color. See the Contents - Select topic for details. The Style panel shows formatting and display characteristics for drawings, images and labels. See the Contents - Style topic for details. Choosing the Style panel we can click on one of the Style properties, such as Fill Color for areas, to see the formatting being applied. We can change the palette, press Update Style and the new formatting will be immediately applied. As we work with different windows and different layers the Style panel will automatically adapt to show the formatting in use for the active window and layer. Choosing the Transform panel we can click on the Convert to Line template and the resulting transform will be immediately previewed in blue preview color in the active window, showing how areas will be converted into boundary lines. To reduce the number of templates in the long list, we can enter text into the Filter box for partial matches on the names of templates. 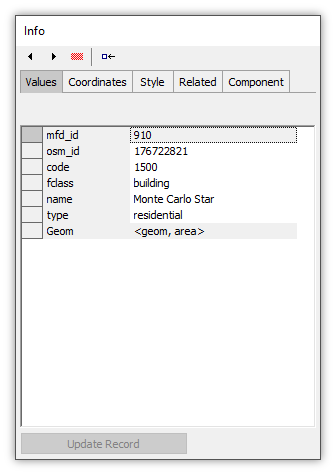 If we still have selected the Monte Carlo Star building that was previously selected, checking the Restrict to selection box will apply the Convert to Line transform to only that object. Clicking a different transform, such as Convert to Point instantly previews that transform in the active window. To apply a transform we can click Update Field. When the Project pane and Contents panes are docked we will frequently click on their tabs to move back and forth between the Project pane and Contents pane. To pop open one of the Contents pane panels we click on the current panel's title bar and then choose the panel we want from the pull-down list. We can also use the keyboard shortcuts Ctrl+1, Ctrl+2, ..., Ctrl+6. Suppose the Contents pane is open to the Record panel. If we click the Record title bar that immediately pops open a list of panels. We choose the Component panel to immediately switch to that panel. We can also use keyboard shortcuts. If we want the Transform panel, with the focus on the Contents pane we press Ctrl+6 on the keyboard. The Contents pane immediately witches to the Transform panel. Most software, including Manifold, makes extensive use of dialogs that are modal. A modal dialog grabs the user interface so we must complete our work with the dialog, usually by clicking an OK, Apply, Cancel or some other button, before we can continue working with other parts of the program. The term modal to describe how a dialog grabs the user interface comes from the dialog's insistence that whatever user interface mode the dialog applies is the only one that is active. A modeless or non-modal pane is one which does not grab exclusive use of the user interface. Both the Project pane and the Contents pane are modeless. We can have the Project pane open to show us a list of what is in the project even as we continue work with other dialogs. Display-only modeless panels like the Project pane are fairly common in software, but in addition Manifold provides the exceptional ability to control the system using sophisticated controls within an array of very powerful modeless panels in the Contents pane. When we call up a panel in the Contents pane that panel is modeless: it is always on, ready to display information or to accept a command with no need to enter or exit a dialog and without locking up the rest of the program. We can continue working however we like and the Contents pane panels will automatically adjust to what we are doing. We can go back and forth between Contents pane panels and other windows, panes, dialogs and other controls without any need to exit or to close the Contents pane panel.